Awhile back my father gave me and old 8mm/Super 8mm Wards projector and a number of films he had taken between 1955 and 1962. I remember watching some of these films when I was a kid and was shocked to see how much the film had deteriorated just sitting in a box in my father’s house. One of the films, the most important to me was a film that contained footage of my sister and I growing up, footage that is of course irreplaceable. 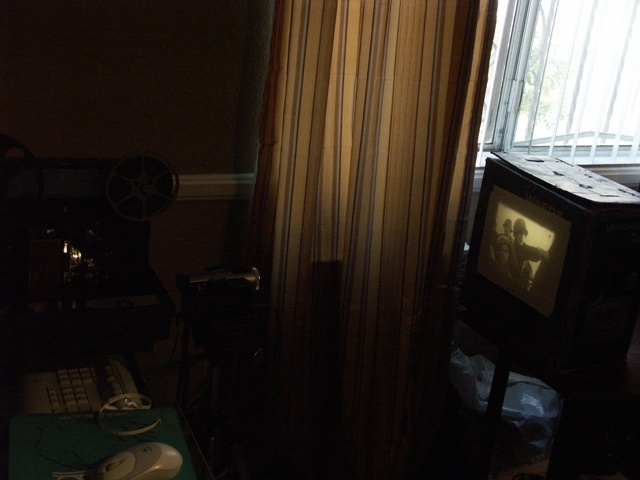 It was then I decided to see what it would take to transfer the 8mm film to digital format for editing and then to DVD. It took allot of time and effort to figure how to transfer not because the process is difficult, but rather finding the best way to do it. The WEB was full of stuff on how others did it but most of it was outside the scope of my budget or missing vital information. 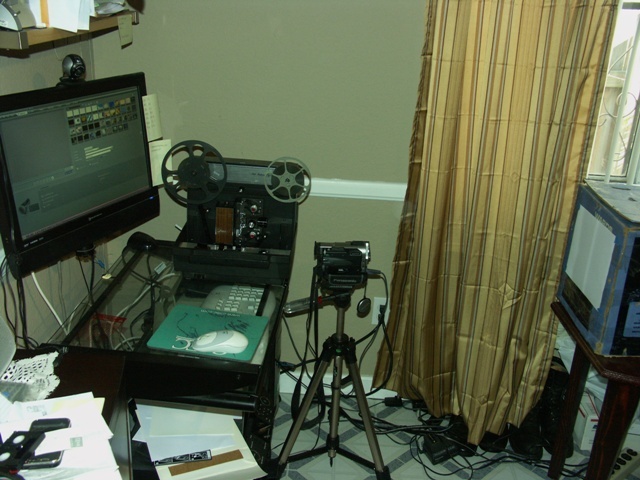 This blog entry is about that adventure and how to transfer your 8mm film movies using the methods and procedures that worked best for me at a reasonable cost. The whole reason for transferring the 8mm films to digital format was to preserve our family history and memories, you can’t put a value on such items because they are inherently priceless. After finely getting a transfer procedure and process that work for me, I decided that I need to transfer a number of films in the highest possible resolution and quality available. This led me to commercial transfer companies; the qualifier for this quality of course is “what I can afford.” Economics play a large roll, you must balance what you can afford –vs- the number of films you need to have transferred. For me this turned out to be one 300 foot reel and a 50 foot reel; these I deteremend were the most valuable to me. I spent vast hours researching companies who did transfers first looking to local companies who offered these services. Even Costco offers transfer service but it was no better than what I could do at home, they simply transfer the film by shooting it in to a condenser box then to a digital video camera (CCD), one of the same processes I tried myself. Eventually I had gone though all of the local resources which ether would not tell me how they transferred, transferred the same way I did at home or were priced why outside what I could afford. I could not be more pleased with my decision to go with GotMemories as my choice; I could not be happier with the transfer quality and the care that was given to me and my film by their staff . I would most definitely use them again and can, without hesitation recommend their services to anyone looking for a quality transfer company. It is not often that you will find a company who cares about making sure you the customer is 100% satisfied. Phil the owner personally called me to help me when I had questions, but more importantly Phil’s wonderful staff at GotMemories called me at each step of the process! When they received my film FedEX they called me to let me know they got there safe, they called me post process to let me know the completed the transfer and they called me after I received my films and DVD’s from them FedEX; where are you going to find that kind of service? Here is a sample of the results GotMemroies –vs- home transfer. Although the home method is acceptable, the GotMemories is just 100% better. One word of warning, and almost every place I found does this, when you see a price on the internet for say “$8.99! !” that is not the price; they will add on a “set-up fee” so I would suggest that if you are going to transfer films though a service you make sure you do as many as you can afford to avoid paying the set-up fee multiple times. So: what did I pay? WARNING your prices will very simply because it so happened that I submitted my order at a time when GotMemories had a special deal. So my total out of pocket was a cool $99.96; was it worth it? YES! BUT and its a BIG BUT is that if you are like me then you could never afford to transfer all your films this way so back to the blog on how to do your own. I experimented transferring my 8mm films by various methods, I used a condenser box, mirror transfer, frosted glass transfer, and several projection transfer methods. I’m not going to write about those method simply because the only one that gave me good results is the one I’m writing about, that said if there is anything you want to know about the other methods drop me an email. Short of making your own frame by frame capture machine (which I’m thinking about making as I thought of a cheap way to do it) the following method worked best for me. Projection method/media, capture camera set-up, capture method, and editing. First let’s talk about what you will need. A good computer with lots and lots of storage and speed; The 8mm 300 foot reel ended up being 3.2mb but after editing; adding sound track that file save as an “DV” (.AVI) file grew to 4.2mb. To make things worse I’m now experimenting with a freeware program that provided a bunch of filters and tool to help clean up the transfers grew my files to 6mb!!! So space is premium! I used my computer that is a 2.0GhZ AMD Athlon 64 3200+ processor with 2 gig of memory and 1 terabyte of storage. I would have like a faster machine but this is all I have right now and it worked well. The computer will need a FireWire 1394a or a USB2.0 port but this will be determined by your camera. I’m using Corel VideoStudio Pro X2 to do my video capture and editing but there is allot of good free stuff you can use like VirtualDubMod http://virtualdubmod.sourceforge.net/ and as always Windows Movie Maker which is also free and will cause you numerous hours of aggravation from crashes and hangs, BUT maybe you will have better luck thank I had. You will need a variable speed projector; variable so you can “sync” the cycles with the video camera. I had the one my dad had given me with the films which is made by Wards and worked great. Originally I though hmmm paper the brightest white I can find would be the best, WRONG!, I found the brighter white I had the more “blowing out” for lack of a better term I had. By blowing out I mean reflective white light causing over an exposure effect in the CCD video camera, this cause parts to be so bright that it would washout the subject. I projected the film on a number of sheets of paper I had at home and the one that gave me the best results was glossy coated Boise Cascade Inkjet photo paper 92 brightness. I used a Panasonic Digital CCD Video Camera model PV-DV910D connectED to my computer via FireWire 1394a. Yeah I know what you are thinking, WEBCAM, yeah so did I. They didn’t work I tried my Logitech and my HP webcams both had poor results. When it comes to video cameras for this purpose smaller is better, you will want a video camera that has the least amount of distance between the lens and the top of the camera. You will see why later. You will also need your video cameras user guide; that is unless you know how to adjust the setting and features of your camera already. You will need to set-up the projector close enough to your PC so that the Firewire or USB 2.0 cable can run between the video camera that will be in front of your projector and the PC. That is unless you plan to capture the 8mm film to tape or mini dvd rather than directly to your PC. Set the White Balance to “Source illumination halogen lamp” or if you are lucky enough to have a camera that you can adjust the white balance by % you will need to do a few test runs to get the white balance correct. My camera did not have that feature. Disable Any ANTI-SHAKE or Image stabilization features your camera might have it took me awhile to figure this one out, I could not figure out why the frame kept moving around. Set up something to project the 8mm film on; in my case this was a small table with the box the projector came in. Set it at about 4 feet from the projector. Turn on the projector and tape the paper to the box where the projection light hits. Raise the camera until you start to see its shadow on the projection screen and then lower it so its as high as possible but not interfering with the projection light or image. Connect the Firewire or USB 2.0 cable between the video camera and your PC. PC: Corel VideoStudio Pro X2 allows me to capture the output of my camera directly to it, as does the free software VirtualDubMod. Not sure about Windows Movie Maker I 69 that longago. Start-up whatever software you are using and put it in capture mode. Turn on your Video Camera and adjust the picture by zooming in until you have no borders in on the capture screen and adjust the Focus. Adjust the speed of the projector to get rid of or minimize the flicker you see in the capture screen. Rewind the 8mm film to the beginning. The room should be as dark as you can get, I lowered the brightness on my computer display as well to minimize the light in the room. Start the Capture on the PC, start the Video Camera if the software doesn’t control it and start the 8mm Projector. Once the capture is complete save your video and move on to the next reel. There you go! You should have a nice finished product that you can now start processing. VirtualDubMod is an excellent freeware product that has bunches of filters and cropping tools that can enhance the footage you just captured. I’m playing with this right now so I can’t give you any procedures yet, as I’m still learning how. But as soon as I’ve figured it out I post another blog. I want to explain why I chose to place the camera below the projector rather and next to, or on the side of the projector as lots of other people I had done. It all has to do with minimizing the Trapezoid effect you get when you capture the projection at an angle. Ideally you would want to capture the projection at zero degrees, this is the reason they sell condenser boxes, so you can get that zero degree angle. The condenser box I had did not give me the results I wanted. I made my decision solely on the fact that the height or the projected film is less than the width of the projected film so placing it below the projection lens does in fact minimize the Trapezoid effect and distortion to the picture. The exaggerated example below is to show you what I mean. This entry was posted in DYI and tagged 8mm, 8mm Film, 8mm Film to Digital Format, 8mm Film to DVD transfer, 8mm to DVD. Bookmark the permalink. Bill great 8mm film transfer to DVD blog there my friend! Thanks for the mention and kind words! Glad everything worked out on your film transfer project. The YouTube video showing the side by side comparison of your home film transfer off the wall method vs our frame by frame was quite a difference, albeit, not a bad effort on your side, ironically your home made method was ten times better than I’d say 70% of the self confessed ‘professional’ film transfer companies in the USA. You have a good start on your own 8mm to digital transfer system. I have also been working on this idea, but using a flat bed film scanner. 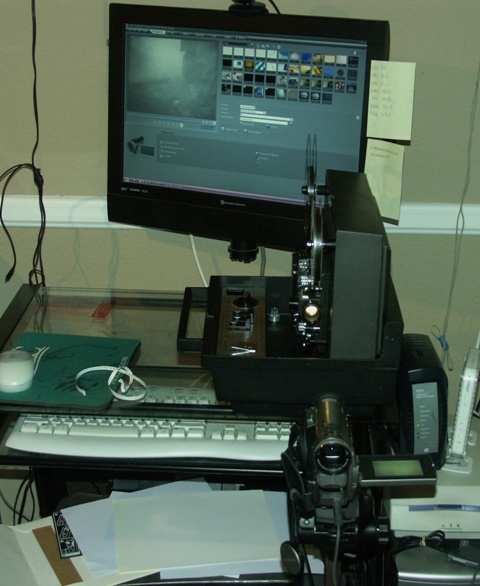 You can look at my setup and writeup at digireel.blogspot.com along with ideas from others that have tried this method. on how to do it with no luck. So I gave up.and ended sending it out. The videos look good. But know I ha ve a dilema. How can I add music to my silent DVD Movies I just received. Perhaps you might be of some help. Because I do not know how. Your procedure looks great on 35mm film to PC transfer.but how about sound.